There are many (some would say too many...) options for safari tours in Kenya: from short 2-day trips to 15-day itineraries, or even much longer. Besides camping and lodging safaris, there are also many types of special safari options available. Masai Mara National Reserve is by far the most popular park in Kenya and it is relatively close to Nairobi. 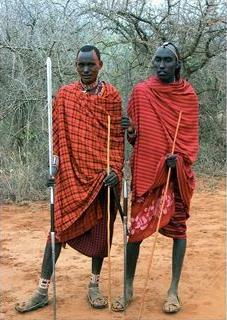 The proud Masai warriors still live in this region the way their ancestors have been doing for ages. Typically, Masai Mara tours last 3 or 7 days. The 3-day trip will be limited to Masai Mara itself, with 2 nights in the park. The 7-day trip usually also passes Lake Nakuru National Park (with the famous, huge pink flamingo population) and Samburu National Reserve. The shorter (3-day) Southern circuit tours basically go to Amboseli National Park, Kenya’s second most popular park, while the longer Kenya safari tours also include Tsavo East and/or West. Amboseli is close to the Tanzanian border, and Mount Kilimanjaro is ever present on the horizon. Tsavo East is elephant country par excellence, while Tsavo West is known for it’s magnificent scenery. Most companies who start this tour from Nairobi will give you the possibility to end the tour in Mombasa, and this can be attractive if you want to add a white sand beach vacation to your safari. Flying from Nairobi to Mombasa is possible every day, but costs a few hundred dollars, while the bus or train is cheap but takes a whole day or night. This is the less traveled circuit. It will take you past some real treasures and there are few tourists there. The main reason is that it’s a few days traveling from Nairobi, if you can’t afford to fly in. The focal point of the Northern circuit is the famous Lake Turkana, while Lake Bogoria, Lake Baringo, the little traveled Marsabit National Park and/or Samburu National Reserve. However, if you’d like to include all these destinations, you’ll need 14 days at least (if you travel by car). The Samburu and Masai peoples are closely related and, together with the Turkana, still live a traditional, tribal lifestyle.